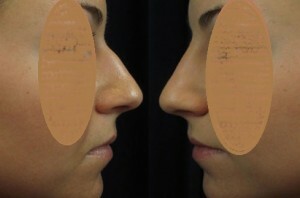 S ome nose shapes can definitely benefit from surgical as well as non-surgical nose reshaping. I often see candidates for non-surgical nose reshaping who are also suitable for surgical rhinoplasty, but it may not be the case in the reverse. Some nose shapes can only be corrected through knife and scalpel. 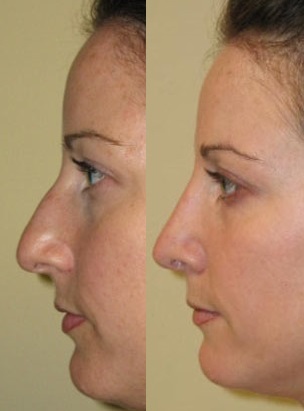 Nose reshaping is popular for both men and women attending me at Castleknock Cosmetic Clinic Dublin. When I started performing non-surgical nose reshaping 15 years ago nobody was doing non-surgical rhinoplasty then. It was unheard of then and most plastic surgeons frowned upon it. They didn’t want anything injected into patient noses for fear of product migration or infection. But over the last decade of experience I’ve come to realise that if choosing the right candidate and the right dermal filler, I can get really nice results in a significant number of my patients. So I choose and select suitable candidates for the non-surgical nose reshaping procedure properly. The same rhinoplasty aesthetics and goals of treatment have to apply to the non-surgical procedure. When I assess my patients I pay special attention to the aesthetics of the nose and it impact on the patient overall look and appearance. We can’t just put any filler in the nose! Before performing the procedure I pay attention to the tip projection, bony prominence and axis rotation as well as the overall slope ratio. I use digital imaging on almost all patients presenting for non-surgical rhinoplasty. One suitable patient is who present with a small dorsal hump. If their bony prominence is surrounded by depression above and below it, then I could I place an amount of dermal filler below and above the bump. It’s important to try and not go for perfect straightness. Favourite startup dermal filler is hyaluronic acid (HA) based dermal filler. One reason I like to use hyaluronic acid dermal fillers for non-surgical nose reshaping is that they are safer for my patients. For starters HA dermal fillers are dissolvable and if the patient didn’t desire the aesthetic correction results after their nose job, it can be taken away safely. HA fillers are also a clear soft gels and not permanent. Some people come asking for Silicone or Artefill as permanent fillers, but these products don’t belong in the nose. Permanent fillers give rise to permanent problems. Great new FDA approved dermal fillers bridging the gap between longevity and safety is the likes of Radiesse and Ellansé. Ellansé is ultimately degradable and lasts for up to four years.